Now any fair dinkum prepper will have a bug out bag. In fact they probably have a few various survival kits and bags tucked around the place. Just in case. There are lots of photos, blogs and videos out there about what to put in a bag. But some seem like you can feed and equip a small nation with them. Lugging that much stuff seems painful and it will be worse if zombies are chasing you. So what should put in your bag and what should you leave out? Well Creek Stewart has the answers! I downloaded a Kindle version of his book for about $10 and it was definitely worth it. Stewart provides very simple and practical advice on what you need. He runs survival courses and his experience shows. He makes it clear having a bug out bag will only give you a small advantage. You need to have the skills. Hence he suggests you take a first aid course, practice lighting fires and building shelters. 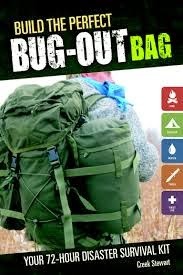 There are tips on regularly reviewing your bag and developing your overall "bug out strategy". There are a good number of photos too. On the downside it is an American book so the equipment is not necessarily easy to get here in Australia. It is also aimed at wilderness survival and there is little about what you may need to stay alive in an urban environment. Sadly zombies are not discussed. Still it is an excellent book and will certainly be guiding the development of my bag.